← New! 2018 Croatia Ferry Schedules! Croatia has been beset by a bone-chilling cold spell this week. 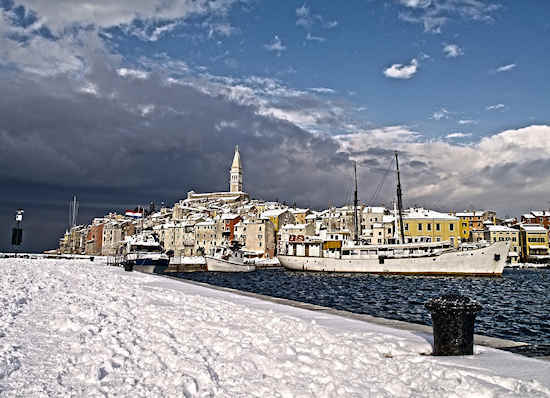 Called the “beast from the east”, Croatia’s unseasonable weather has brought snow as far south as Dubrovnik but preparations for the summer season haven’t stopped. Summer will happen (I know it!) and here’s the news you need to know to enjoy your summer in Croatia. Dozens of low-cost carriers are flying to Croatia this season. (Check out this selection of 2018 flights to Croatia) Of particular interest is the new flight from Venice to Split. EasyJet will run flights between Venice and Split three times a week from June 14 to September 1. For those aiming to combine a visit to Venice with a visit to the Dalmatian coast, this new flight saves a lot of time and money. Otherwise, Croatia-bound travellers need to board a passenger ferry from Venice to Istria and then proceed down the coast. Also new is a connection between Zagreb and Mostar, the highlight of Bosnia-Hercegovina. Croatia Airlines will connect the two cities for the first time in twelve years and it will run twice weekly all year. Finally Croatia is getting international attention for its cuisine! The acclaimed Michelin guide has awarded stars to two additional restaurants in Croatia. Last year, Monte in Rovinj became the first Croatian restaurant to hang a star on its door. Now, Pelegrini in Sibenik and Restaurant 360° in Dubrovnik are also honoured with a star. The Michelin inspectors criss-crossed the country last year and found no less than 62 establishments worthy of mention. Check out the full list here. Covering Istria and the Dalmatian coast in one itinerary has just become easier. A new company, Catamaran-Line will be handling passenger services between Pula and Zadar, stopping at Mali Losinj. Again this year is the convenient Dubrovnik-Korcula-Hvar-Bol-Split ferry run by Jadrolinija which will run daily from June to October. The timetable has just been published. Plitvice Lakes National Park has been struggling with the effects of overtourism for several years now. The primary mistake was in allowing the construction of too many apartments and guesthouses within the park without adequate consideration for drinking water and disposing of waste water. It is a World Heritage Site but Unesco may classify it as “endangered” unless the crowds and the accommodation are better managed. Pula is best known for its Roman amphitheatre but there are also gates, temples and arches dating from the Romans. Now a clever company has arranged for a virtual reality walking tour that allows you to see Pula’s Roman ruins as though you were a Roman from 2000 years ago. A pair of cardboard Samsung VR glasses are provided along with a smartphone app. Presto! Pula’s history comes alive as never before. Check it out! Also new in Pula in 2018 is Camping Arena Pomer which is an extremely well-equipped and luxurious glamping site in Medelin (10km from Pula). The site is so close to the sea you can practically stick your toes out of the air-conditioned tent and into the water. All amenities–flat screen TV, luxury toiletries, walk-in shower, free WiFi–are present and accounted for. The on-site spa and wellness center offer massages, saunas and other feel-good activities. The restaurant is excellent and there’s a playground for the kiddies. If you’ve never considered camping, try glamping! More.